Use the Continents or Sub-Conintents report to see which (sub) Continents are the most popular for your site. This is useful if your business works in any way with countires, mailings, deliveries or regional promotions, physical locations, etc. 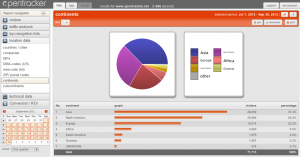 This report lists all known (sub) continents through which people visited your site. Using the calendar, you can select any date range required. The date range is then displayed top right in the Options bar as the ‘selected period’. The columns in the table are; No., (sub) Continent, Graph, Visitors, Percentage. 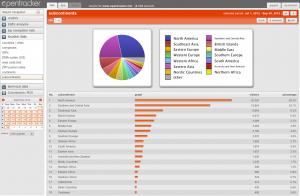 The Continents report displays all visits to your site filtered by Continent. Visually, the report is made up of a list of all Continents from which visits were identified, in order of popularity. The information is displayed in both a pie chart graph and a table. Please note that this report can also be generated for Sub-Continents, see below for details. Sub-Continents Additional report in navigation allows you to drill-down to sub-continents. See screenshot.